For an insect trying to avoid becoming dinner, the consequences of bad camouflage are clear. What's less obvious is how the effects then ripple like an aftershock through an entire ecosystem, subtly changing which shrubs are eaten and which critters thrive. For example, the consequences of a single species of badly camouflaged walking stick insect can cascade throughout the California hills. In a largely overlooked report from September, scientists originally at UC-Boulder studied how the evolution of camouflage has wide-ranging ecological effects. 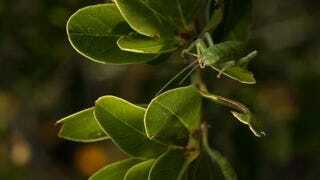 Walking stick insects come in two types: solid green to hide in thick, wide leaves, and green with a white stripe to hide in needle-like leaves. The scientists deliberately mixed the two populations and put them on both types of shrubs, so that half the insects were living in mismatched habitats. A month later, the mis-camouflaged insects weren't doing so well. That's obvious enough: they were easy prey for hungry birds. But other critters—spiders, caterpillars, ants—disappeared from the shrubs with mis-camouflaged walking sticks, too. Were birds attracted to the easy-to-spot walking sticks staying to eat everything else? To test this idea, the researchers repeated the experiment covering the shrubs with chicken wire to keep out birds. This time, there was no difference. But the plants themselves seemed to have benefited from the bird invasion. Without all those bugs chewing on them, they thrived. All of these moving parts are subtly reshaping the California landscape. We can think of this as a story about bad camouflage, but we can also flip it around think of it as a story about good camouflage. With evolution doing its thing—when walking stick insects stay hidden on the shrub they're supposed to live on—their neighbors benefit, but the shrubs they eat might suffer. A good invisibility cloak in the form of camouflage can change the odds of survival as much as more obviously deadly weaponry.